This breakfast burrito recipe is covered in a tasty, and a bit spicy, green chili sauce. This breakfast meal has it all - bacon, eggs, potatoes and veggies. 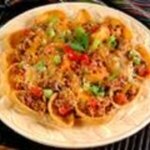 You can modify this recipe to make it healthier by using turkey bacon or turkey sausage. You can also use ham which is a leaner meat. Skip the meats all together and add more veggies to make this a healthier start to your day. 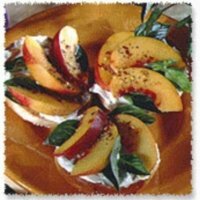 Below you will find the information for this breakfast recipe - Ingredients, directions, nutrition and Weight Watchers points. 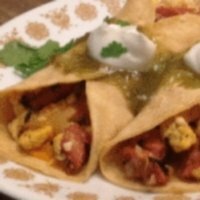 The ingredients and directions below for this breakfast burrito recipe is shown for burritos and green chili separately. While the green chili sauce is simmering, heat 2 tablespoons olive oil over medium heat in non-stick skillet. Add the red and green bell peppers and cook for about 8 - 10 minutes stirring occasionally. Add the potatoes and cook for another 3 - 5 minutes or until potatoes are warm. While bell peppers are cooking, fry the bacon pieces until crispy. Beat together the eggs and a touch of skim milk. Add bell peppers and crumble the bacon into the eggs. Stir together slightly. Place a large spoonful of the egg mixture onto whole wheat tortilla. Place 2 tablespoons of green chili on top of egg mixture. Fold tortilla shell and place seam side down on microwave safe plate. Top burrito with more green chili (about 1/4 cup). Place 1/2 oz shredded cheese on top of burrito. Heat in microwave just until cheese is melted. Optional: Serve with salsa and/or sour cream. Saute onions in large saucepan lightly coated with olive oil. Once onions are tender, add cans of green chilis, canned tomatoes, garlic salt, cumin, diced jalapeno and water. Reduce heat and let simmer about 10 or 15 minutes. combine 2 tablespoons of flour with water. Add water slowly and whisk together until it is a creamy consistency. Pour flour/water mixture into green chili mixture slowly, and whisk until well blended. Let simmer another 5 - 10 minutes until green chili sauce has thickened. Turn off heat. Note: The veggies and eggs were not included when calculating Freestyle SmartPoints. The veggies were not included for the the other points calculation. To reduce carbs, calories and points, make this a naked burrito (no tortilla). If you want this less spicy, skip the jalepenos. For more spice, add the jalepeno seeds. In addition to this breakfast burrito recipe try making these granola bars for a quick breakfast, snack or dessert. Here's a breakfast burrito recipe you can make ahead of time and freeze for a quick, hot breakfast. Who says you can't have dessert for breakfast? 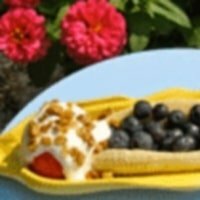 Try this tasty treat made with fruits instead of ice cream. 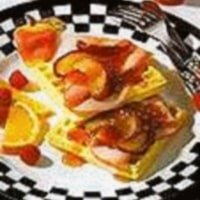 This breakfast recipe is sweet all by itself so you can skip the maple syrup and reduce the WW points. 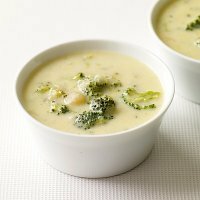 The creamy goodness in this soup recipe will warm you up on even the coldest days. Spice it up with this nacho recipe. Made with ground turkey so it's a healthier version of an old classic. 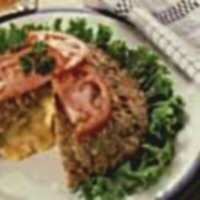 No need to top these turkey burgers with cheese as it's all in the middle. Understand how to read food labels so that you know the nutritional information for the foods you eat and the recipes you make. Limit your fats by changing some traditional cooking methods to a healthier alternative. Use this free online tool to find out your BMR and how many calories you need to consume to maintain your weight.